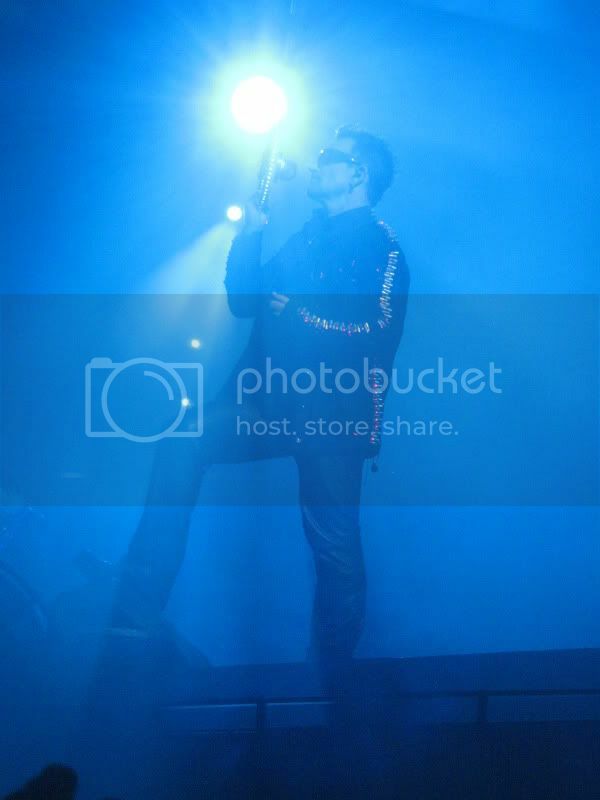 This is a review that I wrote for a U2 fan site that I've belonged to for about 6 years. The group is now pretty dead, and since probably only 2 or 3 people will read the review, I thought I'd post it here as well for anyone else who's interested. First of all, I'd like to take a second and kind of copy another member of the group. At the beginning of her review back in February, she thanked the friend she went with, and I have to do the same. Amanda, we've been through a lot in the last 11 years, and U2 has been one of the things that's brought us closer. Three shows later, and it feels like we've come full-circle - 360 degrees - from the first two times we saw them. Thank you for sharing this with me, and being part of a magical, memorable experience. I'd also like to thank Laura and Lisa, our new friends, who we met in line. Laura, you were our savior that day, a definite bright spot, and I really can't thank you enough. It's because of you that we made it as close as we did, and I'm indebted to you for that, truly. I can't wait to meet up with you (and hopefully Lisa - who, ironically, I'm chatting with on FB as I write this lol) again on the next tour, or if I'm lucky, maybe even sooner! And because I'm not quite done being sentimental, I need to thank U2. I've grown up with them, and grown up a lot in the last few years, with them as my never-ending personal soundtrack. Triumphs, heartaches, good times, bad times and everything in between, they've been there. I can always count on them, and because of that, I will remain loyal to them forever and be more grateful than anyone will ever know. I barely even know where to begin. This has been a long time coming - 21 months, in fact. 21 very long months that I had my tickets, during which time a lot happened, I changed in many ways, grew as a person, and waited anxiously to see the 4 men who have changed my life over the last decade. This trip had a lot of exciting firsts, and for several reasons reaffirmed my belief that everything happens for a reason. Our U2 adventure started out Sunday morning (July 10th), when Amanda and I left town around 9am and headed for Toronto. We had the windows down and U2 tunes blasted, one of my favorite things in the world. 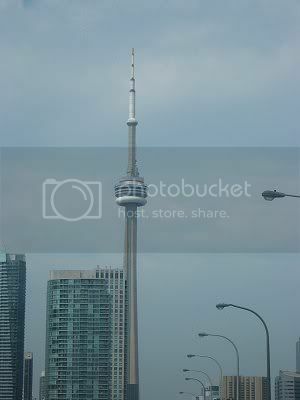 When we arrived in Toronto, it was too early to check into our hotel, so we drove around and ended up at the waterfront. We walked along the boardwalk, got some lunch, played on the beach for a bit, then headed back to our hotel to check in. There was an issue with parking, so we decided that rather than get a ticket or get towed for neglecting to feed the screwy meter, we'd wait until our time ran out and head out then. 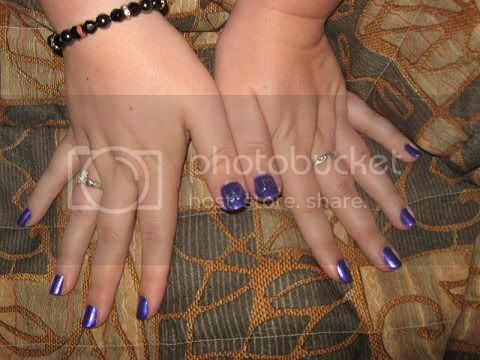 So we changed our clothes, watched some TV, Amanda did my nails (she's started a side business doing nails - she does an incredible job, even the simple design she did this time - purple base with 'U2' in silver on each of my thumbnails), we set up the computer, and finally at 6 o'clock, paid the meter and headed out on the streetcar (a first for both of us!). We got off downtown at the wrong stop (the streetcars are so confusing!) and ended up having to walk, but we found a parking lot that was cheap and decided that rather than take the streetcar early the next morning, we'd just drive, park, and walk (see, everything really does happen for a reason). We made our way to the Rogers Centre, scoped it out, checked out the gate we would have to line up at, and then went across to the CN Tower. Neither of us had ever done the CN Tower before - I had been to it, but never up, so we were both excited and nervous for another first. Amanda's terrified of heights, so I didn't even know if we'd get to go up, but we bought our tickets and headed inside. After wandering around for awhile, we made our way to the elevators and up we went. You can see outside the front of the elevators, and there are windows in the floor as well to look down. It takes about a minute and a half to reach the top. 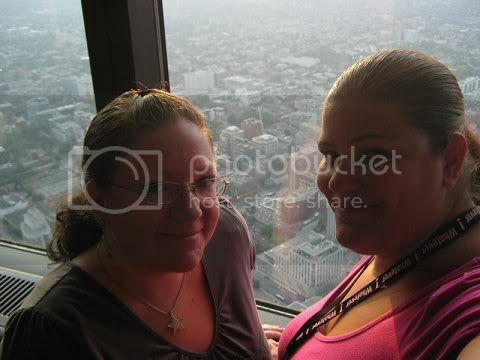 When we got there, we went around, looking out, taking pictures, and just enjoying the view. We could see right down to the Rogers Centre, which was really cool, I just wish the dome had been off so we could have seen the Claw! 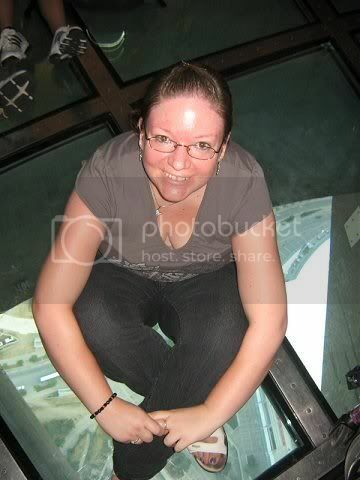 We went down to the glass floor, and after a lot of hand-holding, encouraging words from each other and strangers, we both stood on the glass floor. It was terrifying, but exhilarating - I knew I'd regret it if I didn't do it! When we went back down, we wandered around the Rogers Centre one more time, and discovered a sign at our gate that the GA line had been moved to another gate. We figured out a short cut, figured we were set - we didn't see anyone lined up or camped out yet - and we walked back to our streetcar and headed back for the hotel. After chilling out, uploading our pictures from the day and watching a movie, we went to bed early, with our alarms set for 5 am. We headed out around 6 the next morning - very painful, let me tell you. The only times I've been up at 5 in the last two years were when my youngest nephew was born (4:53 am), and for the Royal Wedding (4:45 am) - lol. I was worried that we were getting a bit of a later start than I'd wanted, and figured it would be about 6:30 when we reached our gate. After parking and walking the few blocks to Blue Jays Way, we freaked out when we saw 100 or so people walking up the street with sleeping bags and chairs, followed by a CityTV camera crew. We booted it up the hill and around the back, thinking that they probably didn't know about the gate change, and we had the advantage of a shortcut. So much for that, though - when we reached the gate, there was no one there. We saw a couple of girls walking around the corner, so we followed them and got in line behind them. This is, again, where fate comes into play. 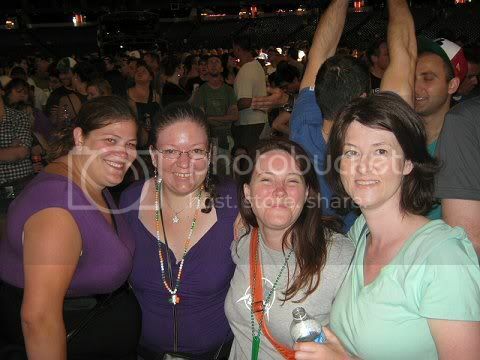 If we had been even a few minutes earlier or later, we wouldn't have met these two girls - Laura and Lisa, from the west coast, who had met at a U2 show - who ended up becoming great new friends, and helping us immeasurably. A pro, with the Toronto show being her 25th, Laura told us what to expect, made sure we ate and drank, helped us stay cool, and she even bought us breakfast. I'm not going to lie - it was a long day. It was hot, we were tired, sitting (and lying) on the concrete was uncomfortable, we had some family issues going on back home that had us worried, and there were definitely times when I wondered at my sanity for all we were going through, but it was all worth it in the end. The camaraderie amongst the fans - some strangers, some old friends - coming together, uniting in their love of this incredible band, was such a wonderful thing to see. 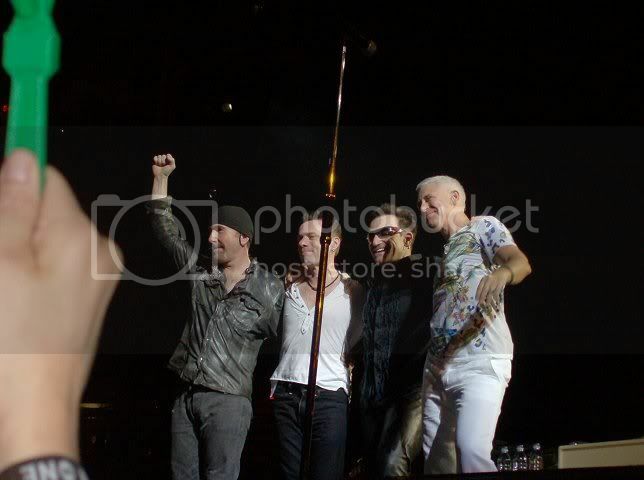 I've always heard how great U2 fans are, and after seeing them in action that day, I'm even more proud to be a U2 fan. Also, the Rogers Centre staff were complete professionals, prepared for everything. I'd heard stories of crazy, disorganized, chaotic lines, particularly at the Montreal shows just days before, and I was worried. 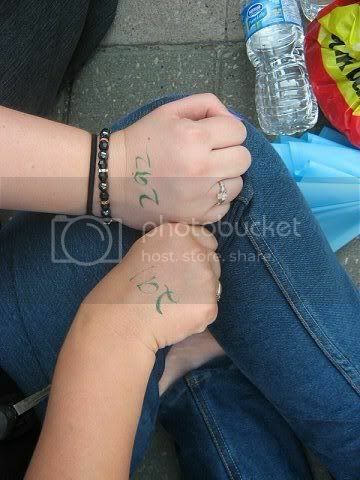 But right from the get-go, security let us know what to expect (numbering our hands - we were 291 and 292! - when we'd get our wristbands, when to pack up, when we'd get into the pen, and approximately what time the gates would open), and kept us up-to-date throughout the day. It all ran so smoothly, I was very impressed. When the gates finally opened, I was so excited that thinking about it now feels like an out-of-body experience. We stepped inside and I must have looked as excited as I felt because I remember the ticket-checker giving me this big grin when she saw me, like she was trying not to laugh, before I went running after Amanda, Laura and Lisa. They had a head start, and Amanda's nearly 6 feet tall, so when I got to the top of the stairs inside the stadium, I was so busy concentrating on not falling that I forgot to look up and at the Claw until I was almost at the bottom. I started running after the girls, who were running way ahead of me, we were yelled at to stop running, and then all of a sudden we were headed around the back of the stage, through the gates and around the front. 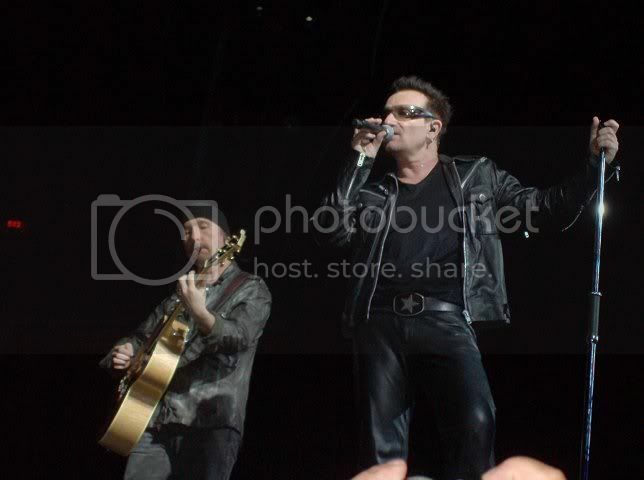 When I caught up with the others, they were 4 rows from the stage, just to the right of where Bono would be. 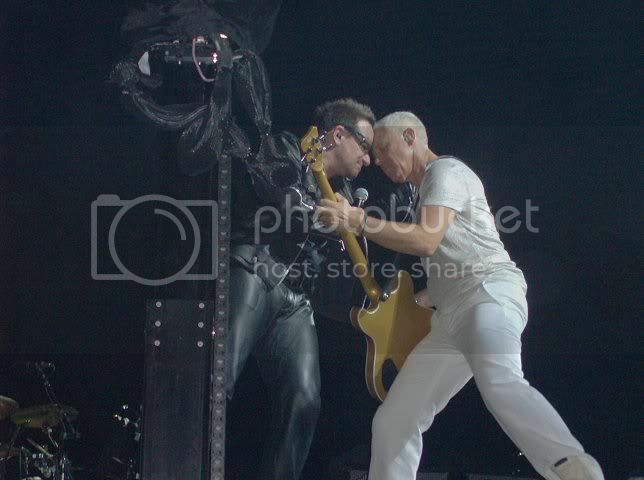 Laura the pro (and Bono girl like me) had chosen that spot because Bono's right-handed and that spot would get us good pictures without Bono's hand in the way, holding his mic. She really thought of everything! We all sat down to wait for Interpol, the opening band, and I just stared at the stage, in complete shock. I had moved beyond excitement and was completely numb by that point. That didn't last long though, as it sank in that we were really that close - a dream come true for me. Laura kept whispering at me to inch forward, so we kept getting closer and closer to the stage. Interpol were terrific. Thanks to a friend who's really into indie music, I've been familiar with the band for several years. People are usually so down on the opening bands because they're anxious to see the main act, but I love live music, and don't get to go to many concerts, so even though I was anxious to see U2, it was a treat to see Interpol. 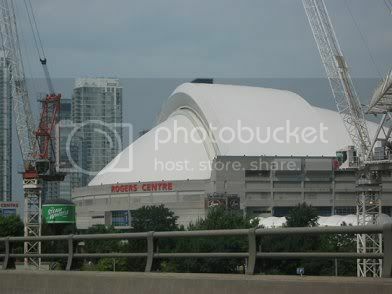 One of my favorite pre-show moments, besides seeing Interpol, was when the dome came off the Rogers Centre. It had been closed because the forecast was calling for rain and thunderstorms. At one point, I heard a woman to my left say to a group beside us, "in a few minutes, we're all going to start chanting 'open roof'...pass it on". I'll admit that I scoffed inwardly, thinking there was no way it was going to happen, because they couldn't control the forecast, but a minute after the group started chanting "Open roof! Open roof!" 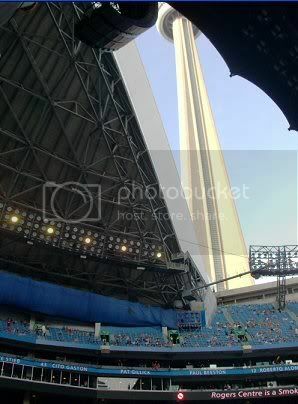 the dome cracked open, and there was the beautiful blue sky, and a minute later, the CN Tower to my right. Before U2 came on, the guy to my left, who I swear was about 7 feet tall started inching forward to block me. The guy to my right was tall too and, panicked, I said to Laura and Lisa (who were in 2nd row) that I was going to be blocked behind two tall men and wouldn't be able to see a thing. There was still a small space right behind them, so they told me to move forward into it. I said that I didn't want to leave Amanda, that I felt bad, but Amanda assured me that because I'm the die-hard fan, that spot should be mine, and she shoved me forward, securing me a 3rd-row spot right before the concert started. When David Bowie's Space Oddity began playing over the sound system, signaling the arrival of U2, the crowd just about lost it, screaming, cheering, clapping, surging forward. 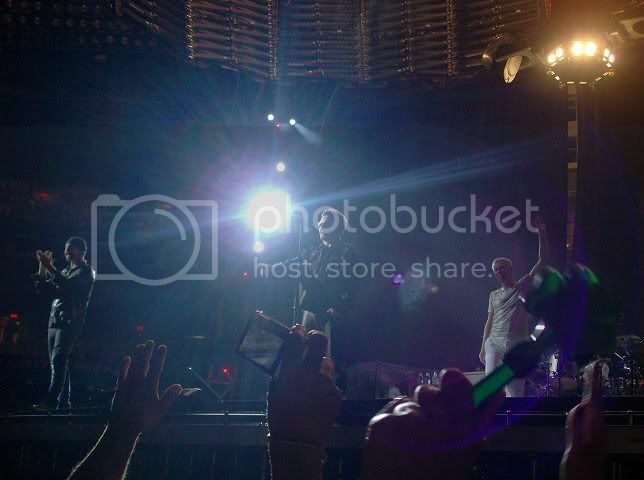 I'll admit that when Larry came out on stage, I started screaming like a crazy teenage fan-girl at a boy-band concert. Larry sat down, popped back up to peek at us over the drumset, a big smile on his face, then sat back down again. 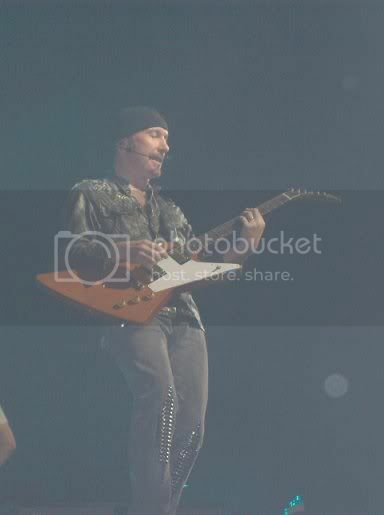 A second later, Edge appeared, followed by Adam, and finally Bono. The fan-girl screaming continued, and a few tears rolled down my cheeks - I was absolutely beside myself with excitment. They were right there - so incredibly close. It was such a surreal feeling. I've seen U2 twice before, but had seats both times, so after spending the last several years watching DVDs of U2's shows from the 80s right up to 2009, actually being there almost felt unreal. It felt like I was living inside the DVDs that I've nearly warn out, like some kind of strange virtual reality. To see them, and be that close, felt like a dream, and I never wanted to wake up from it. They kicked things off with Even Better Than the Real Thing. "'Come on now Hogtown...in the summer night...where you going to take us? Under the pale moon...where you going to take us?" The crowd was into it right from the first second, and lived in that moment for the entire two hours and ten minutes of the show. There were so many songs from Achtung Baby and Zooropa that I felt like I'd been transported back to the ZooTV tour in the 90s, which I'd always wished I'd been able to go to. Bono apologized for the delay in returning to Toronto. "Thank you for your patience...some of you were two years younger when you bought tickets for tonight's show...I'm feeling much better, thank you." And it was obvious that he really was feeling much better, because he was in fine form, and all four of them were all smiles through the night. I completey lost myself to the music, dancing and singing along, not a care in the world, just me, surrounded by friends, four of the most influential men in my life, and 60,000+ fans. 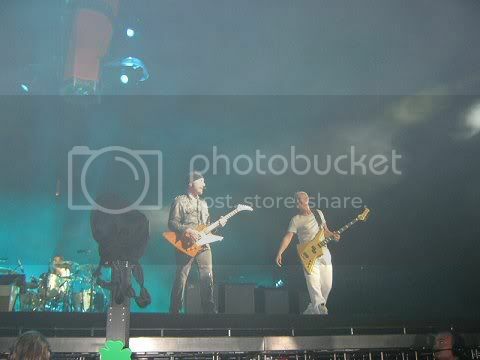 Bono, my idol, was right there, Adam spent 90% of the show in front of us, and Edge made appearances on our side, too. With my camera constantly poised, I snapped away, taking about 500 pictures and half a dozen videos so that I could re-live the night over and over in the years to come. I was disappointed at first that we couldn't be closer to the stage, but the stage was so high that if we were any closer, I think I would have had trouble seeing. 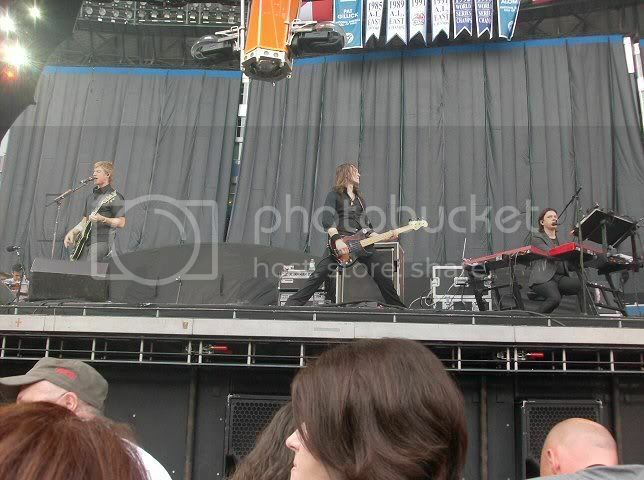 After seeing all their DVDs, I dreaded the moments when they would leave the stage to wander the catwalk or bridges, but they stayed on the main stage for most of the show, only leaving a few times. I was a happy, happy girl, and felt truly blessed. Stay (Faraway, So Close!) 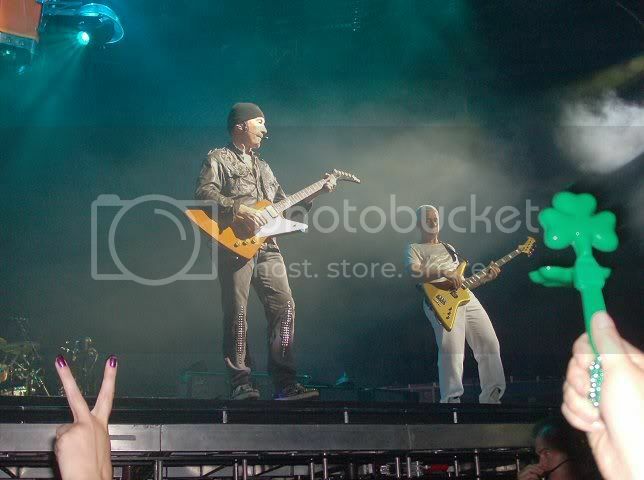 was another great moment because Bono and Edge were so close to us, and it's always been a favorite of mine. 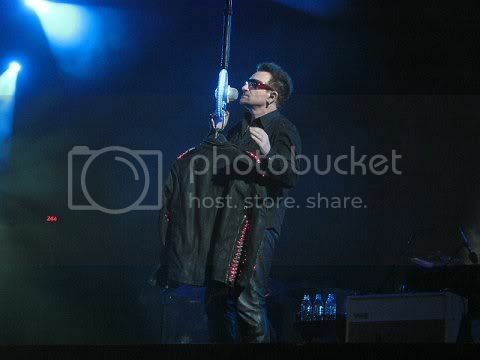 Larry had a big Canadian flag attached to the front of his drums for the show, and during Elevation, Bono wandered off and when he came back, he had a Canadian flag tucked into the back of his pants. "Can we take this space station any higher on a Monday night? Noisy, noisy folks. Don't tell us you treat all your rock stars like this!" Hell no, Bono, only you! Possibly my favorite moment of the night came at the beginning of Hold Me Thrill Me Kiss Me Kill Me. It's never been a favorite of mine - I liked it, but never loved it - but after that night, it's now a favorite. When Bono came swinging out on his microphone, I was so surprised, it took me a minute to get my camera poised, and when I did, it kept saying 'charging flash' (which it did a few times during the show, like when Larry passed by with his drums during the I'll Go Crazy Remix), and Bono stopped right in front of us, looked around, then right at me, and hung there for a minute, waiting for me to get my shot. If I had been near hysterics before, I just about lost it then. Best. Moment. Ever. I got the rest on video, and have watched it dozens of times since, loving watching Bono enshrouded in fog, swinging on his microphone in his wicked-cool glowing jacket. And just to prove to myself that I wasn't imagining that moment, I've found a few videos that other people took of HMTMKMKM and my breath catches every time he stops in front of us. Something else that was incredible was hearing all 60,000+ fans singing their hearts out through the show. Bono always stops to let the audience sing during I Still Haven't Found What I'm Looking For, but he did it during another song too (can't remember which), and he just stood there, looking out at us with a huge smile on his face. Bono - the rock god, known by people in every corner of the earth - was humbled. It brought tears to my eyes to see the look on his face. He lives this every day, has done countless shows over the past three decades, but he's still humbled and amazed by the reactions of his fans. It's nice to know, and it made me love him even more (who knew that was possible?). I didn't want the show to end. When Moment of Surrender started, I wanted to cry because I knew it was almost over. I would have given anything for just a few more minutes, even though I was in agony from head to toe, exhausted and dehydrated. Bono asked for the lights to be turned off and pointed out the nearly-full moon that had been 'laughing at them all night long' and asked us to take out our cell phones and light up the stadium, while thinking of someone we had loved and lost. It was such a beautiful, emotional moment for so many reasons. "You're incredible people, you've got an incredible country. Thanks for loaning it to us for the evening..."
When the show was over, I got my first real look at the 60,000+ people in the stadium as we all surged for the exits. The sidewalks and streets outside the Rogers were so congested, we could barely move. Amanda and I decided that rather than spend another night at the hotel, we would head home because she wasn't feeling well, and she was afraid she'd be really sick in the morning and wouldn't be able to drive us home. I was feeling numb again by this point (although unfortunately not physically - I was in such agony, I didn't think I'd make it to the car), and we spent the drive home listening to U2 and reliving every magical moment. So, 21 months after buying my tickets, and 24 hours of the longest day ever, it was all over and we were back home. If it wasn't for the pictures and videos, I think I'd honestly wonder if I'd imagined the whole thing, or wonder if it was some amazing, vivid dream. It was a great couple of days, an incredible night and a mind-blowing concert. I couldn't have asked for more. I've got to include a few links here, just in case anyone's interested. 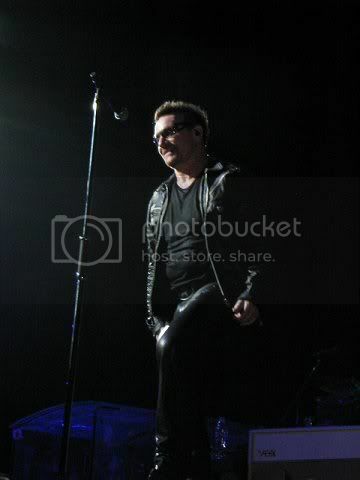 Just a couple of days after seeing U2, still riding a high unlike any other, I discovered that an article I'd written about U2 after seeing them live for the first time, but had posted when I started freelancing late last year, had been made article of the day on the site it was posted on. I was honoured and thrilled, and the comments I got from fellow fans had me smiling all day as they came in on my BlackBerry. 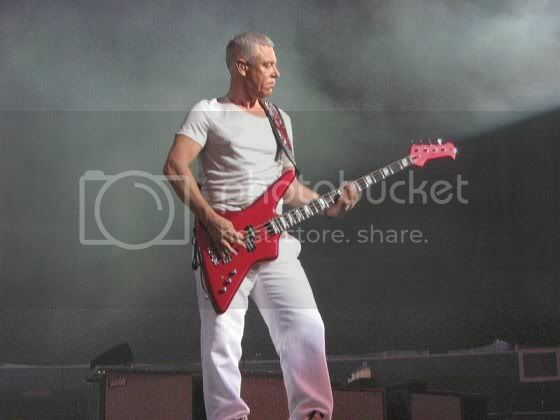 I'm also including links to my concert review for another site I write for, along with the review from my first concert, my favorite Irish bands (U2 has top spot of course), and my page with my videos from the concert. I also have links to the complete albums of my photos from the concert on Facebook if anyone wants to see all the pictures I took (well, not all of them, just the better ones, a couple hundred altogether I think). Also, 3 of my videos. I might post a few others, but these are the best ones. You got some great photos. Toronto is one of my favorite cities. I haven't been there in a few years, but I used to go there every year and stay at least a week. I haven't followed U2's music in recent years, but I was a big fan in the 80s and 90s. They are a great band. Thanks Lee! Toronto never used to be a favorite - I spent two years practically living there from the age of 8-10 because my dad was in and out of the cancer hospital there, and eventually died in Toronto, so it was always the city I associated his illness and death with. 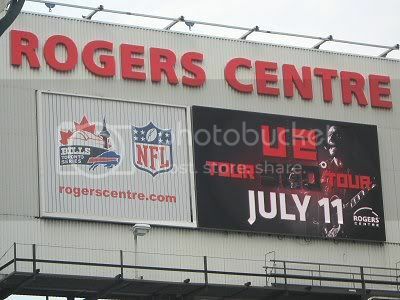 Over the years, I had to go back for school trips and stuff, started to like it a little more, and then it was when I saw U2 for the first time in Toronto in 2005 that I realized it wasn't such a bad city after all, and I've thoroughly enjoyed all my return trips there since. There's just so much to do and see - I hope you get to go back soon! 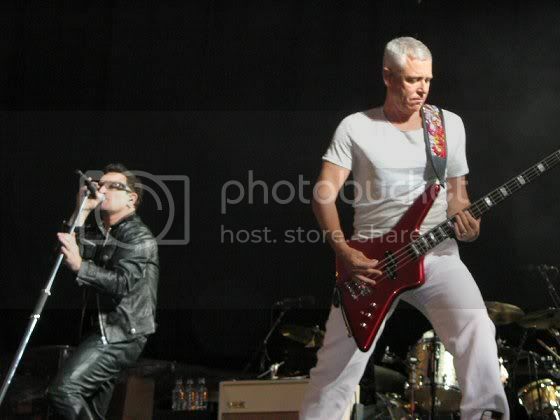 U2 really are a great band, and I've heard many people say they followed them in the 80s and 90s but not really beyond. I just love it all! lol Thanks for stopping by!